An overnight oats recipes with lots of plump berries and endless possibilities! I know January is the time most people make resolutions. For me, back to school is when I decide to change my life. After experiencing the chaos of summer break, I feel utterly disorganized and behind in life. It’s time to take change all of that. This will be the first time all three of my kids will be in school full time. I have to admit, I’m a little sad. This means my baby is growing up and slowly climbing her way out of the nest. But it also means that for the first time in 11 years I will have a whole, quiet house to myself. Would I rather my home be filled with the joyous laughter of children? Yes. But going to school is the law and I’m not homeschooling so this leaves me to embrace my newfound freedom position. And embrace it I will! I’ve already made a spreadsheet of my fall schedule. Go ahead and call me a nerd if you like, but I’ll be an organized nerd. I worked out exactly what I’m going to do each day. This includes a new cleaning schedule, work schedule and finally an exercise schedule! It’s about time. This mama needs to get shape! Before I know it Christmas cookies will be filling my kitchen, I need to be armed (with perfectly toned biceps) and ready! The kids being sent off to school in the morning means we all need good breakfasts to get us moving and ready for whatever the days bring us. This overnight oats recipe is perfect for each member of the family. It’s quick, easy and totally customizable for all our individual tastes. I simply parcel out the portions of oats and milk into containers each night (which takes all of 5 minutes), place the containers in the fridge before bed and when we wake up, we can add in fixings until our hearts are content! 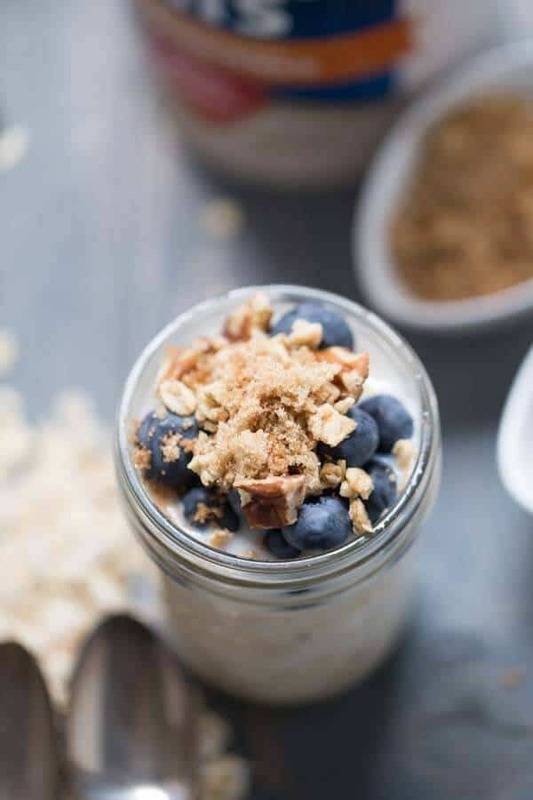 My overnight oats recipe is topped with all the things I love, fresh, plump blueberries, buttery pecans, crunchy granola, brown sugar, cinnamon and a pinch of ginger. It’s like a blueberry crisp in a jar! But you can literally top your oats with anything YOU like! Coconut, hazelnuts, raspberries, nutmeg, dried apricots, flax seeds, peanut butter, almond butter or anything else that makes you happy. This recipe is like a blank canvas, you fill it with what makes you happy! There you have my new fall resolution, work efficiently, eat better, live happier. I like my new plan! 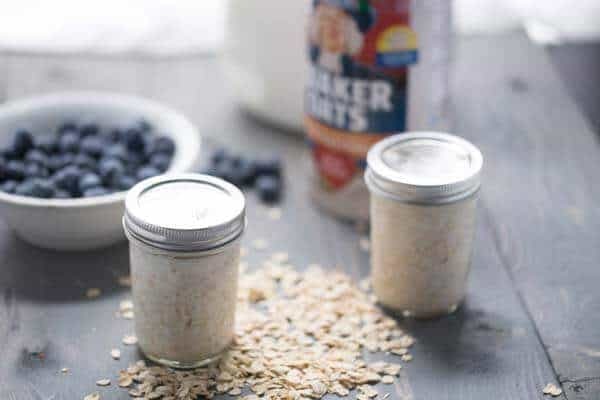 Overnight oats are the simplest breakfast recipe to prepare! They are ready when you are, all you need are the fixings! Divide oats between two containers, top with milk. Cover and place containers in refrigerator overnight. 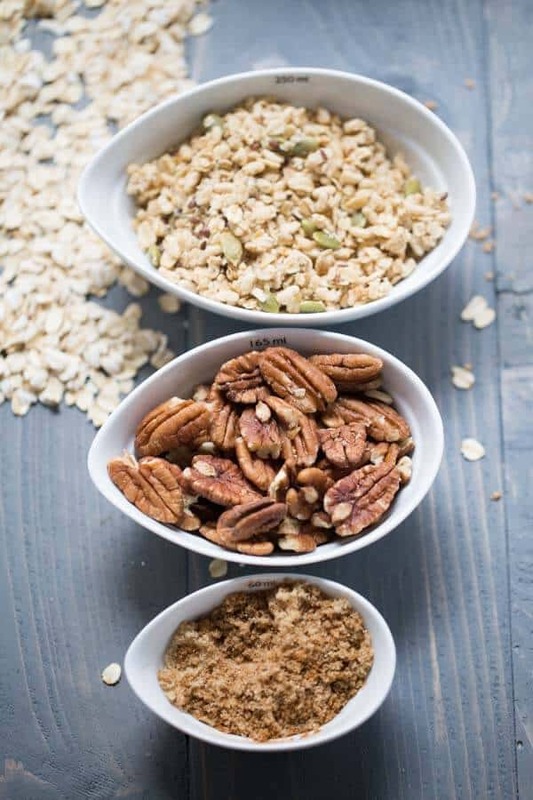 In the morning, top each container with 2 tablespoons of blueberries, a tablespoon of pecans and granola. Divide sugar and spices between both containers. Serve. Disclosure: I received compensation from QUAKER® Oats for recipe development purposes. All opinions are my own. 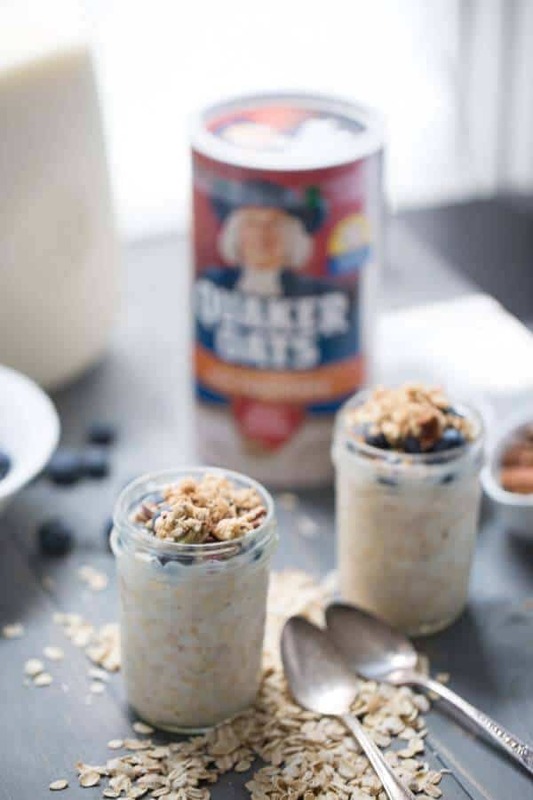 For more QUAKER® Oats recipes, click here. We’ve been eating lots of overnight oats lately. The blueberry crisp flavor in these sounds amazing! I love overnight breakfasts for busy weekday mornings! Sounds delish!! Sounds like a delicious combo! The return of school is just like New Year’s Eve in that its the start of something new and its a great time to start something new! Can’t wait to try this breakfast! Can you believe I’ve not made overnight oatmeal… I really need to change that with this recipe! 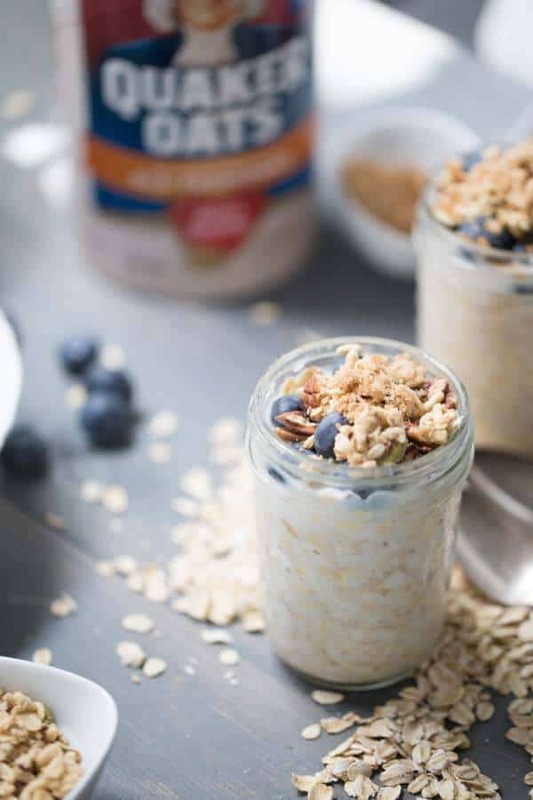 We haven’t had overnight oats in way too long – thanks for the reminder that I need to get this option back into our breakfast rotation! I need to get back on track with healthy eating too! This is the perfect way to start off on the right foot this fall! I totally know what you mean, I am trying to get organized too! And in shape! Easier said than done…but I would like to think that I could get a nice head start with these yummy overnight oats! This looks so great. I have a problem eating blueberries by themselves but I love them in oatmeal. Stopping by from Bewitchin Projects linky. Oh, yum! I love how you can make it the night before. I need recipes like that. Thank you for linking up to Creative K Kids’ Tasty Tuesdays Linky Party. I have pinned your recipe to our Tasty Tuesday’s Pinterest Board. Looks yummy I haven’t tried doing this before yet. Pinned & shared. Thanks for joining in the Inspiration Spotlight party.